Thanks to USA Today for this photo. Officials said about 300 state-maintained roads and 160 bridges remained closed. Eleven dams in the southeastern state have failed, the state Emergency Management Division said. More than 2 feet (60 cm) of rain have fallen since Friday in parts of South Carolina. The state avoided a hit from Hurricane Joaquin but experienced historic rainfall and flooding due to a combination of weather mostly unrelated to that storm. Of the 15 people who died, nine drowned and six were killed in weather-related car crashes, the emergency agency said. 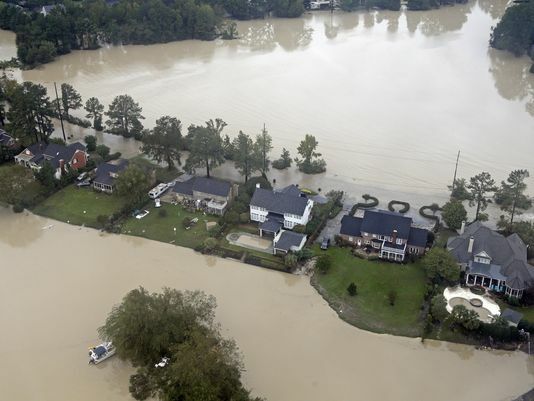 The extended rainstorm also was blamed for two deaths in North Carolina. CBN News reported on 7 October that at least 17 have been killed in the crisis. Additionally, it pointed out that many municipalities have experienced contamination or destruction of their water sources.